He worked just after the labe Baroque period. The two trends that dominated his contradictions were the reaction against the previous conception of art and the desire for a new form of expression. 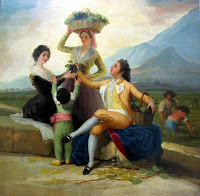 He started his formation in Zaragoza but at the age of 17 he went to Madrid where his style was influenced by Tiepolo and Mengs, the Venetian painters working there at that moment. He travelled to Italy when he learnt fresco painting and when he came back he was commanded the sketches for the vault of the Pilar. Once in Madrid he started draft designs for tapestry, firstly with works about fishing and hunting scenes, of French influence, but most frequently about folk life and countryside. He recognised the influence of Velasquez and Rembrandt and nature. In 1780 he was elected a member of the San Fernando Academy, submiting “The Crucified”, following the academic rules. In 1785 he was appointed Official Painter to the Court . In 1792 he went completely deaf and the gaiety of his work disappeared, the colours became darker, the brushwork losser and more expressive. Apart from painting for the court he also painted for himself. He did not care for royalty who tried to please and pose for him and he exposed their weaknesses on canvas, shoving their true characters. His portraist reveal an insight into the enchantment of women and children. Some of these are like a last farewell to the joys of life for soon Goya retired into the isolation of his Quinta del Sordo. Meanwhile the Napoleonic Wars came and went. 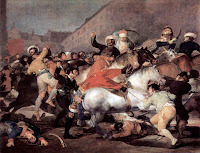 The frightful horrors suffered by the Spanish people filled Goya with such bitterness that he turned the full power of his art into an attack on the insase behaviour of his fellow creatures. Between 1810 and 1814 he produced his famous series of etchings –The Disasters of War –and the paintings related to the war. These two works show an extraordinarily powerful and expressive use of colour. Goya concentrated on achieving that was irrelevant. They represent a revolutionary advance in the whole conception of the range and purpose of painting. War was depicted as futile and inglorious and for the first time there were no heroes, only killers and killed. 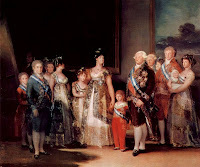 During the latter part of his life, before moving to France, Goya covered the walls of his Quinta with the balck paintings, the last and most weird and extrovert of his production. In many ways he person ified the spirit of Spain, where the power and beauty of death seemed brood in the air. He produced four series of etchings: the Caprichos, the Disasters of War, the Tauromachia and Disparates. All of them belong to moments of different crisis. In general they tend to be critic with the society of his time, what in some cases alerted the Inquisition. These works gave him the opportunity of producing in complete freedom, without the sevitude of commissioned work. He died in Bordeaux in 1828.